A diamond that receives the AGS-0 Ideal Cut rating for all three categories (polish, symmetry, and proportions) is commonly referred to by those in the know as an AGS-0 Ideal Cut Diamond or a "Triple Ideal Cut Diamond". Triple Ideal Cut Diamonds are those stones that have achieved the highest standards currently acknowledged by independent gem labs. Issued by an independent gem lab, these reports provide a thorough evaluation of each stone and identify the diamond's imperfections. The information listed is so specific that it can be used to identify a particular stone at a later date. The American Gem Society is the leading gemological laboratory that assigns a cut grade to the round diamonds it examines. They use three factors to determine this grade: polish, symmetry, and proportions. 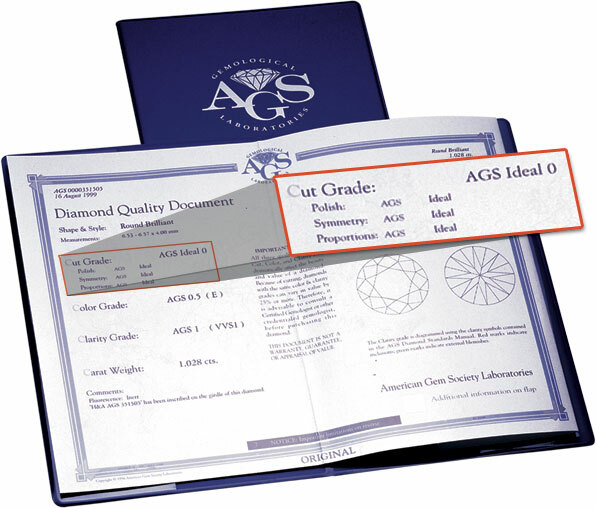 The AGS assigns a zero (0) grade to the diamonds that have met "ideal" criteria for all three factors. Most AGS certified diamonds are laser engraved with the certification number on the girdle (see image) which provides an added measure of security if your diamond is ever lost or stolen. The final finish must be perfectly void of any streaks or marks left over by the manufacturing process. Every facet needs to be of equal size and perfectly opposite its counterpart on the crown and pavilion. Ideal proportions are those strict angles and proportions that will maximize refraction and reflection. When proportions are ideal, the diamond will appear whiter because more light is reflected out of the crown. Even diamonds with more color will face up whiter.